Leeds chairman Massimo Cellino has agreed in principle to sell his share in the club to supporters' group Leeds Fans United. The Italian, who is currently appealing against a Football League ban, met with fans on Friday. He said he would sell his majority share, without making a profit. "100% I will sell to the fans, if they want to buy it and look after the club. The fans are the only asset the club has," he told BBC Radio Leeds. "I'm sad and embarrassed. My dream was to do my best but I've achieved nothing and family aren't even with me. "I'm trying to protect the club but at the same time it means I have exposed myself. The result is that the fans say 'Massimo it's time to go'." Leeds Fans United launched in April with the aim of buying a minority stake in the club and securing representation on the board. They tweeted: "Leeds Fans Utd has today reached agreement in principle with Massimo Cellino to purchase a majority stake in Leeds United Football Club." Many supporters called on Cellino - who has been banned from running the club twice since his 2014 arrival - to leave Elland Road after a 2-0 home defeat by Blackburn on Thursday left them 18th in the Championship. United would be the highest placed English club to be owned by their fans. "This is coming at the same time that he is facing another ban from the Football League. "There has been a lot of pressure on him from the fans and the national media this week. I think it is the fans chanting against him at Thursday's game that has made up his mind. He sounded genuinely distraught. "There is a real malcontent around the club at the moment. He's done some good in his time there but I believe the time is right for a change. "I've spoken to Leeds Fans United and I don't know how much money there is there now but I know that there are people willing to back their initiative." April 2014: After initially being prevented from buying the club he successfully appeals and becomes the majority owner. May 2014: Manager Brian McDermott leaves the club after the end of the season. August 2014: His surprise replacement David Hockaday is sacked after just six matches. October 2014: Slovenian Darko Milanic is sacked after six games and just 32 days in charge. December 2014: Cellino is banned from running the club by the Football League after an Italian court finds him guilty of tax evasion. He appeals against the decision but is unsuccessful. 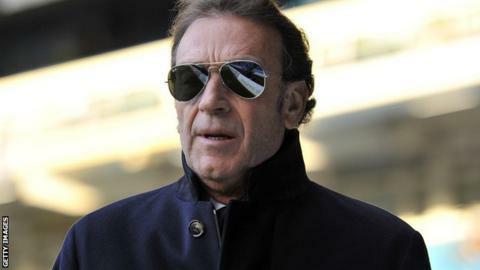 March 2015: Cellino's ban is extended from March to the end of the 2014-15 season. May 2015: Replaces Neil Redfearn as head coach with former Brentford and Wigan boss Uwe Rosler. October 2015: On the same day he sacks Rosler and replaces him with Steve Evans the Italian is banned from running the club by the Football League for a second time. He has submitted his appeal against this decision. It is understood he faces further legal cases in his home country.